The Wilmington and Beaches Convention & Visitors Bureau provides the following services. If you have a media related need that isn't listed, please give us a call. 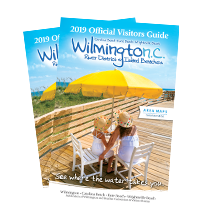 Provide background information on Wilmington and our island beaches - Carolina Beach, Kure Beach and Wrightsville Beach, including attractions, accommodations, restaurants, meetings and conventions, shopping, entertainment, arts and culture, sports, history, travel-related services and more! Fact-checking of articles about Wilmington and our island beaches. Online image library - Provides images of destinations upon request. Restrictions apply. Please contact us for image library instructions. Assist journalists and editors with assignments and suggest a wide range of story ideas. Coordinate press trips for representatives of the media. Restrictions may apply. Itinerary development - Itineraries can be customized based on interests and length of stay. We will do our best to accommodate your special requests. Coordinate press trips for representatives of the media. Restrictions may apply. Click here for press trip guidelines.